Technology is designed for our convenience and security. But even with the advancements and high standard technologies that we have today, incidences such as glitches still opt to occur. This can particularly be seen in the electronic and telecommunication industry, wherein incidences caused by faulty devices and the environment are common. This gives the rapid rise of the manufacturing of explosion proof phones in the market. Explosion proof phones are telephones that are made primarily for voice communication and are designed and structured for hostile and hazardous areas to promote safety and security of the place. These phones are engineered specifically so that they do not produce sparks that could initiate a combustion, flame, or explosion, therefore, providing a safe and reliable communication without the frets. They are strictly checked and tested to maintain high quality standards. By nature of its construction, explosion proof phones are installed in industrial sites where hazardous environment present imminent danger of explosion. These phones can be used in either indoor or outdoor areas, especially in places like chemical plants and factories, nuclear facilities, refineries, aerospace sites, mills, bulk loading stations, mines, drilling rigs, power generation facilities, depots, munitions storage areas and offshore platforms. 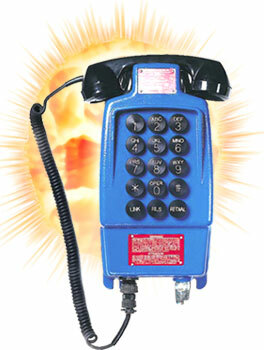 Explosion proof phones can be thought of as an armored equipment like the battle tank and the armored car. The phone’s rugged body could be made of cast aluminum, but for weight considerations, impact-resistant and shock-proof materials like polycarbonate are also used. They are manufactured with special features like oversized buttons for gloves-on operation, copper-free cast aluminum housing, heavy-duty industrial handset cord, weather proof, safe handset, corrosion and moisture resistant circuitry and they can even work best even in extreme temperatures. In an industrial firm, safety of both environment and workers is one of the most important aspects to consider. Governments are even implementing strict policies when it comes to these matters due to high incidences of explosions. Because of the advantages that explosion proof phones offer, they are being marketed easily. Anyone can just look for these kinds of phones in local markets or even on the internet. Due to high demands of these remarkable phones, many brands are being released on the market today under great competition. So when considering to purchase an explosive proof phone, it is always best to look for the one with the best features to help on the safety level of an industrial firm. These phones are now being used by more and more business firms due to its great performance and high endurance level, for nothing is more important than prevention. So when considering the highest quality safety need of a hazardous work place, explosion proof phones fit just right for the job. Not only that explosion proof phone serves as a communication gadget, but a safety device as well. They are a must in every industrial firm for they offer just the needed highest safety level.